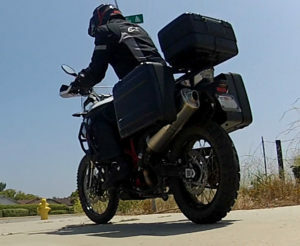 The BMW Vario panniers are an inexpensive (considering the competitors) way to get yourself a full set of panniers. 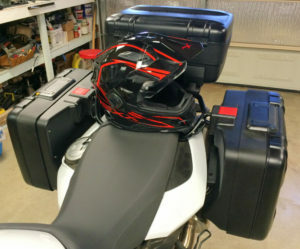 This set of cases fits the BMW F800GS/F700GS/F650 and can be accessorized with backrest pads, inside nets and liner bags. When it comes to functionality, the Vario series fares pretty well. These cases are a breeze to take on and off the bike in a matter of seconds and with a clever mechanism they can be expanded to increase their capacity and carry an incredible amount of goods. 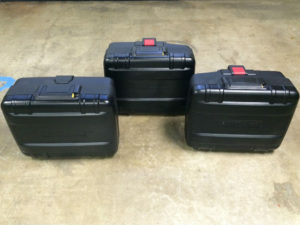 When retracted, the box volume is about 28 liters for the right side and 19 liters for the left one, but when extended by rotating the U shaped handle inside, they reach respectively 38 and 29 liters and are capable of holding a max load of 17.6lbs. In the real world where you run around town or commute to work those black plastic bags look very appealing with their sleek and stylish lines, the ability to lock them with the same key used for the bike ignition is incredibly convenient as well. 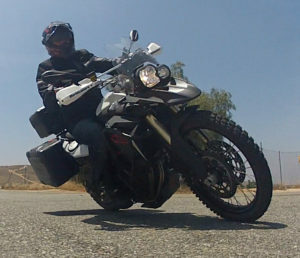 When the panniers are in the retracted position they are slightly less wide than the handlebars giving the driver the ability to split lanes or zip thru traffic (in those states that allow it) wile when extended they appear to be just a 1″ wider than the handle bars on each side and do not get in the way of your passenger. The BMW Vario panniers, although a great product, have some faults. 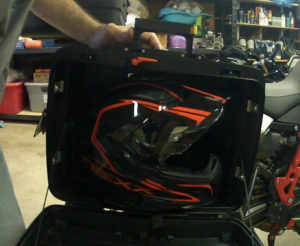 Only the right side bag can store a full size helmet, especially a dual sports one, although you might be able to store a half or an open face helmet on the left side, so if you carry a passenger with you there is a chance that one of the helmets will have to stay outside and endure the elements. The odd shape of the left case, to allow room for the exhaust, makes it difficult to utilize the full volume available, but if you are an expert Tetris player you should be ok. Last but not least, if you elect to go off-roading with it and trash it around, it cannot be banged back into shape like an aluminum case and I have the suspicion that if dir t or mud end up in the extending mechanism there could be some problems with it. All and all those cases aren’t by any stretch of the imagination flimsy, they are a solid piece of luggage capable of withstanding a few hits, after all they are built with the legendary BMW quality and come with a BMW Motorrad 12 months/12000 miles warranty. For a complete set they can be paired with the BMW vario top case giving loads of carrying capacity and an incredible look.